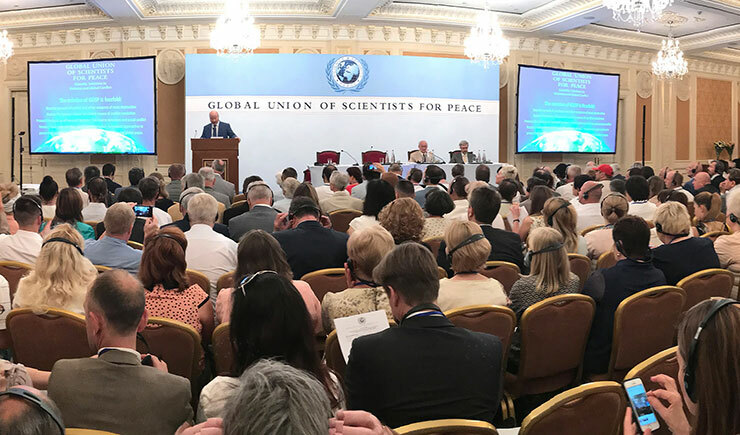 The Global Union of Scientists for Peace is an emerging force in the prevention of terrorism, war, and social violence through the application of cutting-edge, field-tested solutions in the areas of conflict resolution, national security, and global peace. he Global Union of Scientists for Peace (GUSP) arose from the ashes of the failed Nuclear Non-Proliferation Treaty (NPT) Review Conference in 2005. This diplomatic breakdown underscored the political world’s dangerous addiction to weapons of enormous destructive power—weapons that threaten the existence of the human race and other planetary species. Today GUSP has become a driving force in international efforts to prevent terrorism and war and to promote global peace. Research and promote the use of evidence-based, nonviolent approaches to preventing conflict, promoting national security, and achieving global peace. Since Russell-Einstein, many leading scientists and scientific coalitions have persistently warned of the grave dangers to humankind posed by nuclear weapons. Yet despite these persistent warnings, nuclear nations continue to expand and/or modernize their deadly arsenals. Some have developed destabilizing battlefield weapons, like the nuclear “bunker buster,” which blur the line between conventional and nuclear war and thereby increase the likelihood of nuclear first use. And today, many non-nuclear-weapons states, in defensive response, are intent on developing their own nuclear capability. The historic motivation for treading the nuclear path has been that there is no secure shield against nuclear attack—and consequently, the only feasible defense has been to possess one’s own nuclear arsenal and thereby pose a credible threat of devastating nuclear retaliation. This strategy of defense based upon lethal retaliation—a.k.a. “mutually assured destruction” (MAD)—has created a dangerous global standoff. History records numerous instances where spiraling tensions nearly unleashed a devastating nuclear war. And recent events underscore the threat to civilization posed by a single, unstable ruler with access to the nuclear trigger. With the shifting geopolitical landscape and the rise of terrorist nation-states, the strategy of nuclear deterrence is increasingly ineffective and outmoded. The threat of nuclear retaliation will not deter terrorist groups or suicide bombers, who are willing to sacrifice their own lives to wreak destruction upon their political and religious enemies—or terrorist organizations who possess no sovereign territory that could serve as a target for a retaliatory strike. Today, every nation is vulnerable. Even the mightiest nations have fallen prey to escalating terrorist attacks. Conventional military approaches appear unsuited and unable to prevent such attacks. Diplomatic efforts face similar challenges. In a world torn by deep-seated hostilities and regional tensions, compromise and diplomatic solutions have been elusive. Hard-won negotiated settlements and ceasefires typically afford only fleeting relief. Paper treaties among rival factions have proven too fragile a basis for lasting peace. Clearly, a fundamentally new approach is needed. The scientific research is increasingly clear: Traditional approaches to conflict resolution and conflict prevention fail, in large measure, because they do not address the underlying cause of violence and social conflict: they do not relieve the acute political, ethnic, and religious tensions that fuel terrorism and conflict. For diplomacy and other conventional approaches to succeed, we first need an effective means to defuse these deep-seated tensions—an approach that can prevent these societal tensions from reaching the boiling point. It is gratifying to report that such innovative, effective approaches to defense and conflict prevention exist—and in key respects, already have a better track record of success than conventional approaches to security and peace. These innovative, evidence-based approaches are the primary focus of GUSP today, and are described in detail in the section Defusing World Crises.